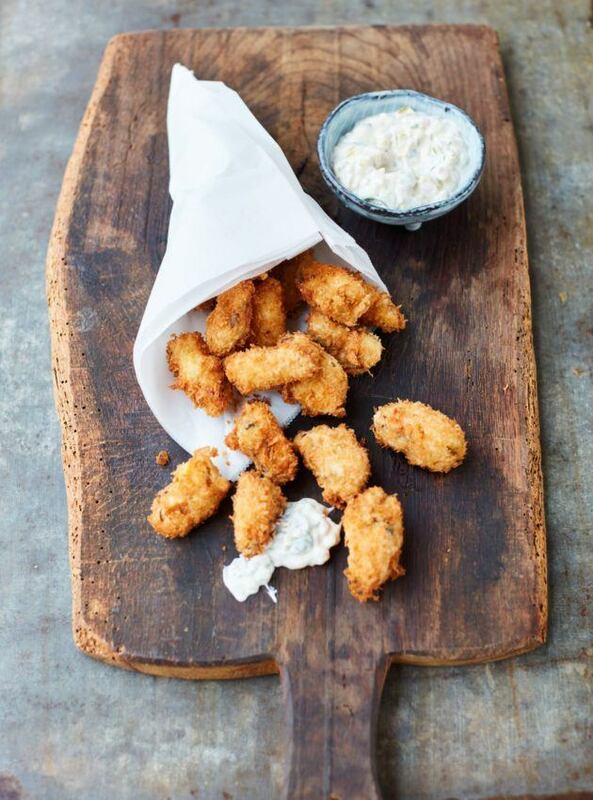 These crispy mussels with tartare sauce are perfect with a cold beer! It might remind you of fish and chips. For this recipe simply steam fresh mussels, take out the meat and then fry it! Watch here how to cook mussels the easiest way. Make the sauce. Cut the celery into small cubes. Cook them shortly in boiling water with salt for 1-2 minutes. Remove the cubes, cool them in ice water and then drain well. Mix the mayonnaise, celery cubes, pickles, shallot and parsley. Season the sauce with lemon juice, tabasco, salt and pepper. Put aside. Heat the oil in a (frying) pan to 180C. Put the flour, egg and panko in separate bowls and put them side by side. Dry the mussels with kitchen paper or with a clean tea towel. Now roll the mussels first through the flour, then through the egg and finally through the panko. Fry the mussels in the hot oil until they are light brown. Make sure there is enough oil in the pan so that the mussels are fully covered. Remove the mussels then from the pan and drain on kitchen paper. Serve the mussels with the tartare sauce.